Another great week here at CSE. 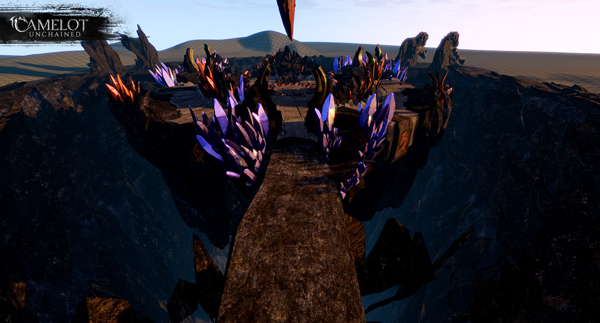 Work continues apace on the game and our push to Beta 1. And as you folks can see from today’s User Stories, more gameplay features are going into the game on a weekly basis than in a very long time. OTOH, we are also continuing to focus on our engine’s performance and capabilities. As usual, let’s start with the Top Tenish™ list. Armor items are now broken up to include more slots, per current design. Under and outer layers are supported. Put on a shirt, then put armor on top of it. Equipment is no longer split up by gender or race, and can be swapped between players while retaining the expected visuals. For Beta 1, we plan to have cross-Realm restrictions for armor (not yet implemented). Beta 1 restrictions will be different from launch restrictions. Design now has the ability to set starting inventory as well as equipped gear. This is partially moved from our editor, and is now easier to execute. Finished Design stat pass to support this update. Values are, of course, going to change. 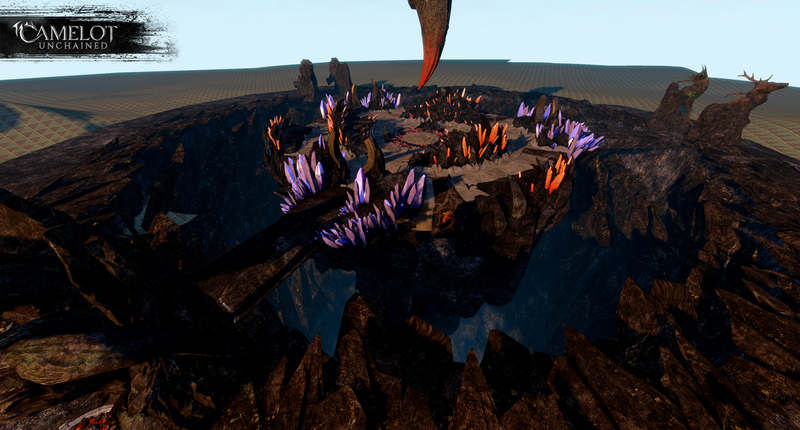 WIP – Design/Tech – Crafting – What a difference having some additional programmers makes! With Christina coming up to speed quickly on the code, both items and crafting have gotten much-needed programming support. Mark, Ben, and Christina have been pushing the crafting system’s vision for Beta 1 into a more evolved and richer version for the opening of Beta 1. While it will still be heavy on data and light on the “bright shinies”, the system will have a lot of stuff for our Backers to chew over during Beta 1. Fixed broken specular at certain view angles. Improve the problem where dark forests were overly lit from outside, or under lit from inside. Rolled back previous changes to “fix” this. Fixed environment lighting contribution radius parameter. Handy for testing. General speed-up of main lighting shader (about a 40% reduction in fill cost). Tech/Art – Audio: dB has continued to add in more work for subtle ambient tracks, and has been working with Gabe to fix a bunch of issues this week. Ambient tracks now play at the correct time of day, and the sound system’s camera is now properly oriented. It’s pretty important to know which direction that battlecry or death rattle is coming from! Tech – Guild and Social UI: JB streamed this week showing off the new social UI, which will be used for both Warbands (groups) and Orders (guilds). Check out the stream here. JB also showed off a bit of the work on ranks, and editing them with permissions. WIP – Tech – First pass manual aiming: Matt re-enabled our old aiming code that Andrew previously worked on during pre-re-abilitation. This is still very much a work-in-progress, but gets us moving towards testing a rough pass of these mechanics. This includes a targeting camera with a predictive arc visual. Tech – Experimental Patcher is dead! From the end of last week to the end of this one, we’ve been running tests on the updated patcher. We’ll continue getting more users on it over this weekend, and if all proves successful, we’ll do away with the experimental version that addressed some issues a small number of Backers encountered. Thanks to all of you who helped us test these changes. 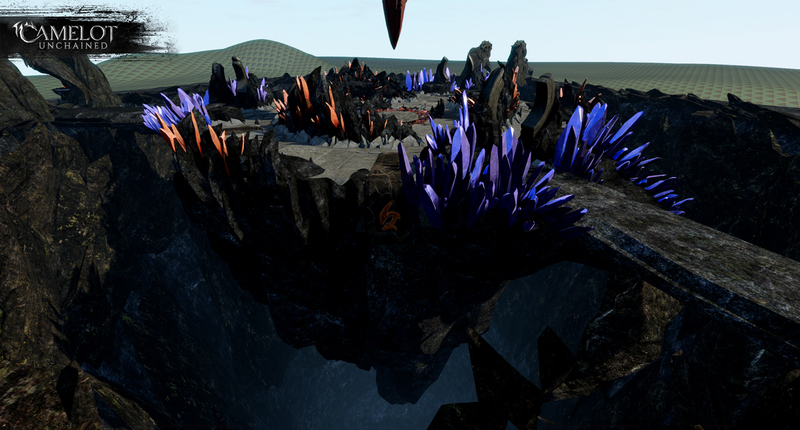 WIP – Tech – Separate physics server: Colin committed this code this week. Our next step is to spin up the actual server and see what happens! If all goes to plan, lots of players will be constructing or destroying buildings, combined with any other updates running in physics code, without any hit to networking performance. Art – WIP – Place of Power: We updated all the statues, as seen in some out-of-game shots last week, updated the large dragon tooth hovering over the scene, and began importing all the pieces into the game, creating LOD’s, and starting on polish, VFX, and lights. 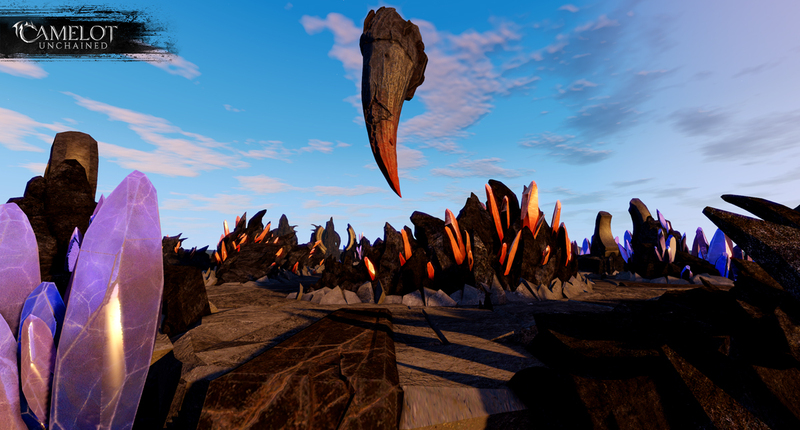 We’re also creating a PoP test zone with some surrounding terrain, to make a barren and rocky terrain mod re-using some of the work on the PoP. 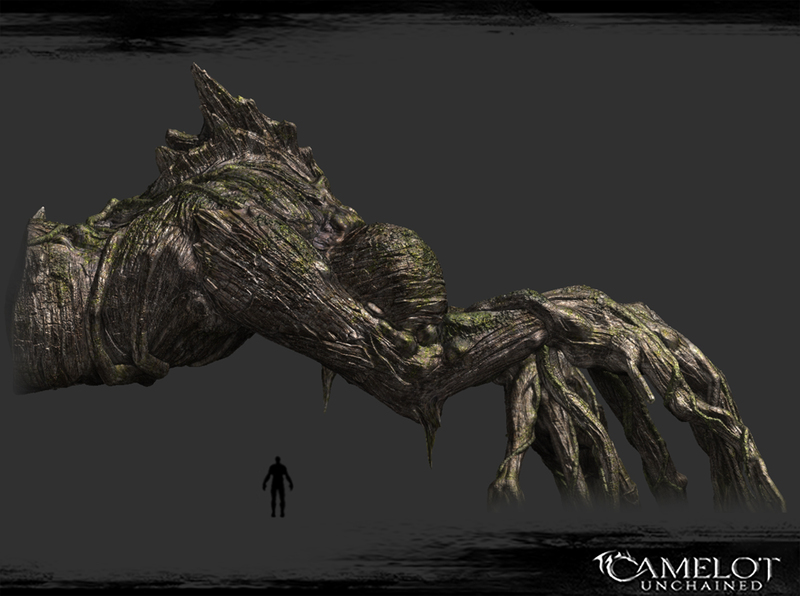 Art – Environment: Jon knocked out an additional human-shaped root structure for a unique forest asset, in the next forest. Screenshots in today’s update. Art – Characters: We finished culling through the changes needed for our items/armor update, including some fixes to visual bugs. 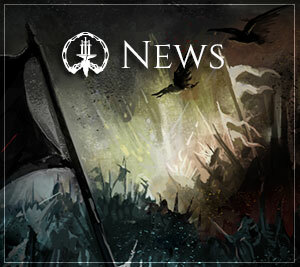 We have more improvements and minor bug fixes for characters planned, time allowing. 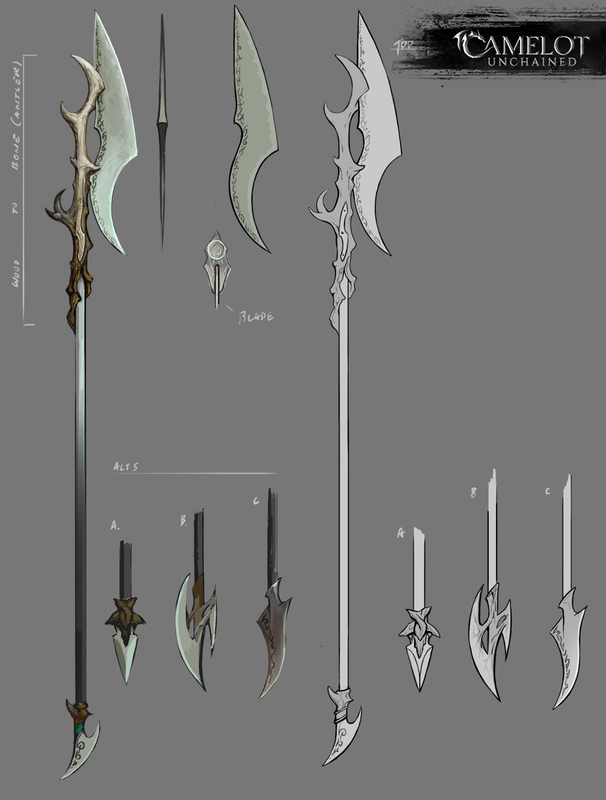 WIP – Art – TDD and Viking unique polearms: Michelle finished the concept art for our chosen TDD weapons, which you can see from her stream HERE. Jon began the sculpting phase, which was also streamed this week. 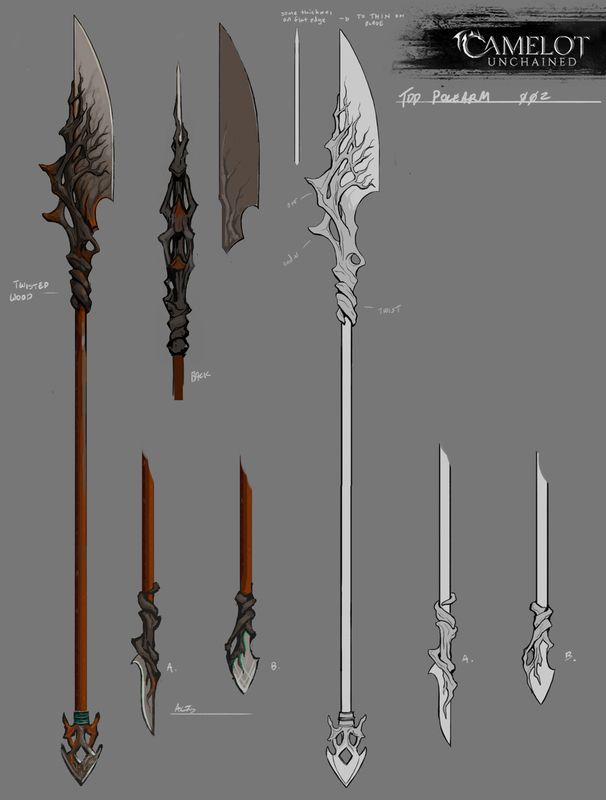 We’ll finish these up next week and add them to player inventories, along with the Viking polearms. Check out the images later in the update. WIP – Art – Animation: Toward the end of the week here, Scott was able to get back to updating the hand geometry on our characters, as well as updating some of the idle animations to support the changes. After completing a preliminary pass on polearm animations, Sandra has gone back to work on the secondary animations, like skirts and cloaks. Very important to look sassy while swinging your polearm! 20 Old cards with 52 completes. As a Backer and Developer, I’d like to see increased visual fidelity and improved performance in the dense test forest. Another great two-week update from us, more updates like that one are coming, that I promise you. 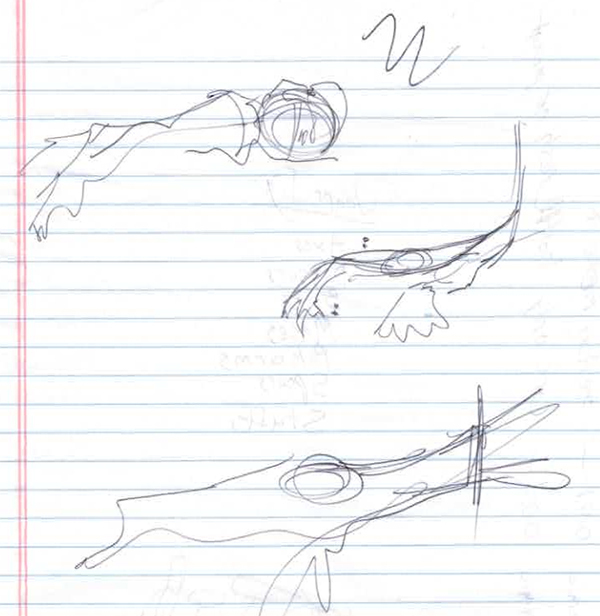 In terms of this week’s “purty stuff” from Artland, sometimes art discussion require a bit of really quick sketching to convey an idea. 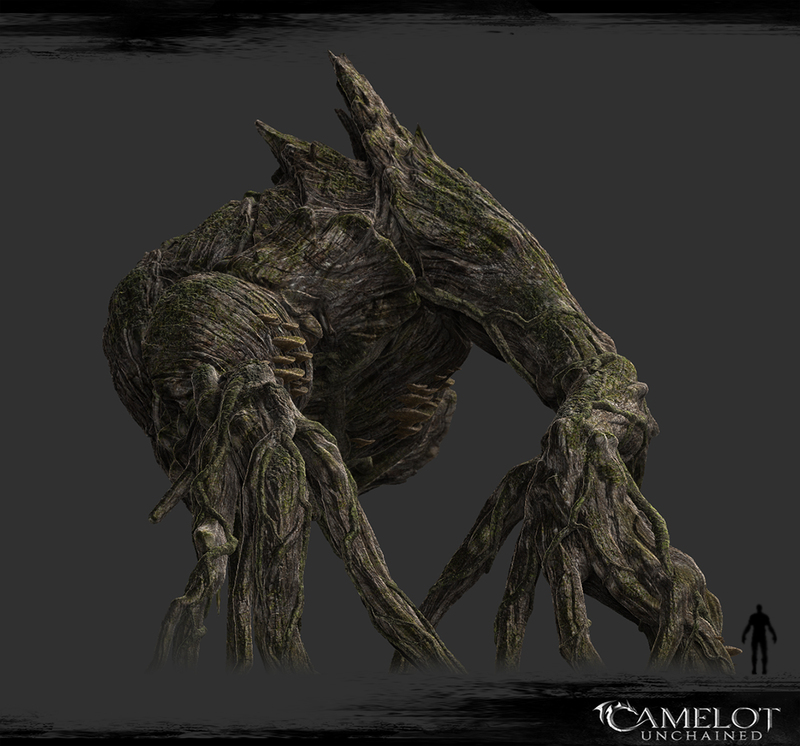 Take this lovely “sketch” (and calling this a sketch is like calling what I did on today’s stream, singing), Tyler gave Jon when trying to convey what he needed for a unique tree asset. Not much I know. I’m told there was some awkward miming involved as well. With that loose “sketch,” and the power of talent, Jon created this awesome piece! The plan here is to append this to a unique tree in the next forest as a root structure coming off the side. Last week we showed you the quick TDD polearm sketches Michelle completed. This week, we chose two to create, which got an extra concept pass before going to the modeling and materials phase. 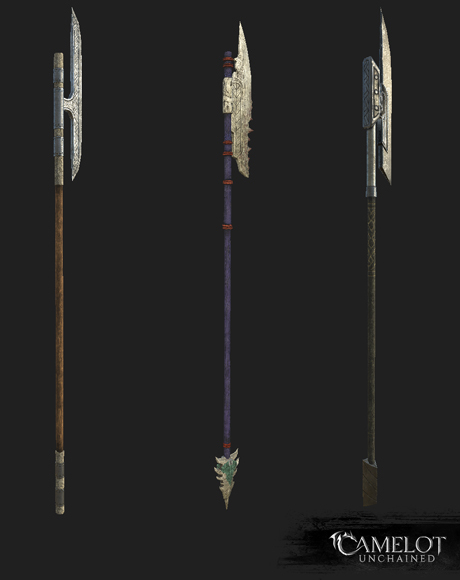 Not to be outdone, we resurrected our old Viking polearms with updated materials. Now all realms will have unique assets, vs. previously sharing the Arthurian polearm. Earlier this month Michelle streamed some of her concept work, and noting it was on Valentine’s Day, she knocked out some quick concept for a themed weapon. 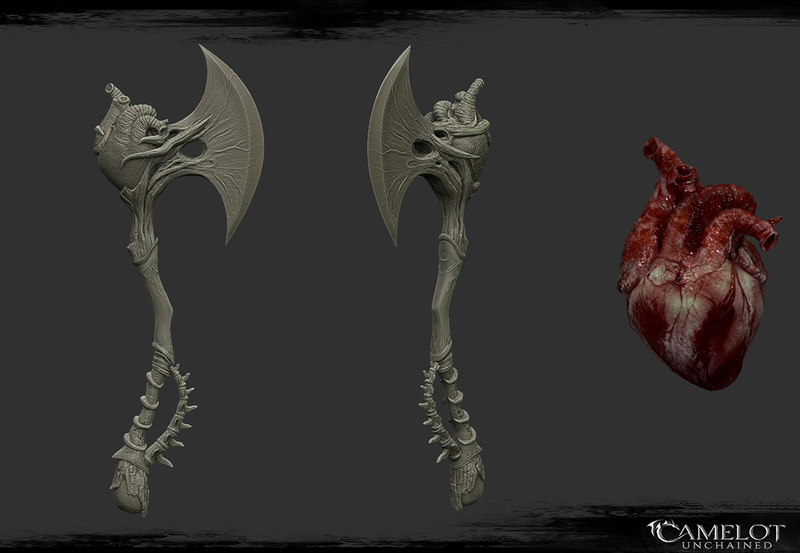 Here’s some WIP shots of the high poly model. That wraps it up from Artland folks! The animation system is a WIP. This is not how we expect animations/combat to work in a few weeks, let alone a few months. This is simply a first pass that involves laying the technical groundwork for the next pass. Physicians are broken right now as their vials aren’t working. This is already fixed in the Hatchery build, but we didn’t want to push this to what is an overall stable build. In terms of other news, I, along with the Lady J and Michael, are heading over to the West Coast at the end of the next week. I can’t guarantee that we will have a get-together with Backers as we usually do, but if you are in Portland or Seattle and want to get together, here’s the thread you can post in to tell me (https://forums.camelotunchained.com/topic/15846-mj-and-family-head-west/). That’s it for today’s update. Once again, it was a great week capped by a weekend test of an overall stable build. Have a great weekend all and I’ll see some of you in the game!